Industrial Donut in Savoy has announced its grand opening plans. And for one lucky customer, the opening weekend will end with a sweet surprise! According to the much anticipated donut shop’s Facebook Page, Industrial Donut will open on Friday, April 19, at 7:30 a.m. until 1:00 p.m.
Industrial Donut is the first business in the new building that neighbors the Savoy Aldi. The new donut shop will sell made-to-order, customizable donuts created in small batches and served hot. For more on Industrial Donut, including the Champaign couple behind the business, see our post. What’s even better than a new donut shop coming to Savoy? One lucky customer will receive FREE donuts for the rest of 2019! The first 100 customers, 18 years and older, will receive a ticket to be entered into a drawing for one dozen free donuts each week, for the remainder of 2019. Terms and conditions apply. 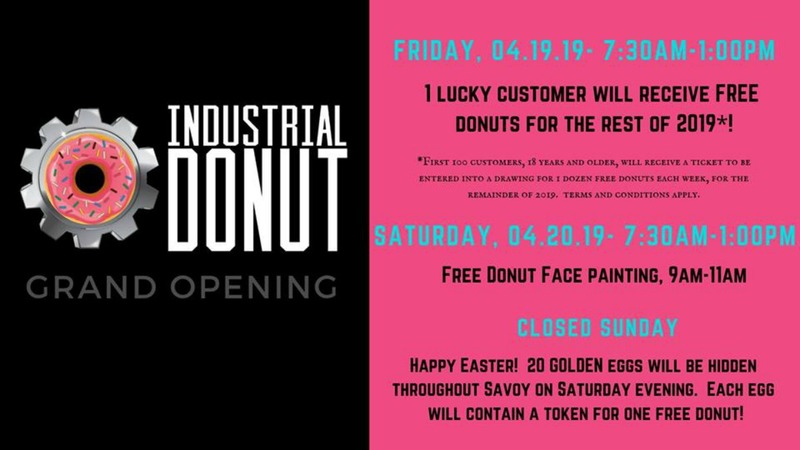 Saturday, April 20, 7:30 a.m. -1:00 p.m.
Free Donut Face painting, 9:00 a.m.- 11:00 a.m.
For more opening weekend fun, Industrial Donut will celebrate its grand opening Easter Weekend with an egg hunt. They will hide 20 GOLDEN eggs throughout Savoy on Saturday evening. Each egg will contain a token for one free donut. For more on the Grand Opening Weekend, see the Industrial Donut Facebook Event. For more on Champaign-Urbana’s best donuts/doughnuts, visit our roundup of reader favorites.